It happened in Texas. 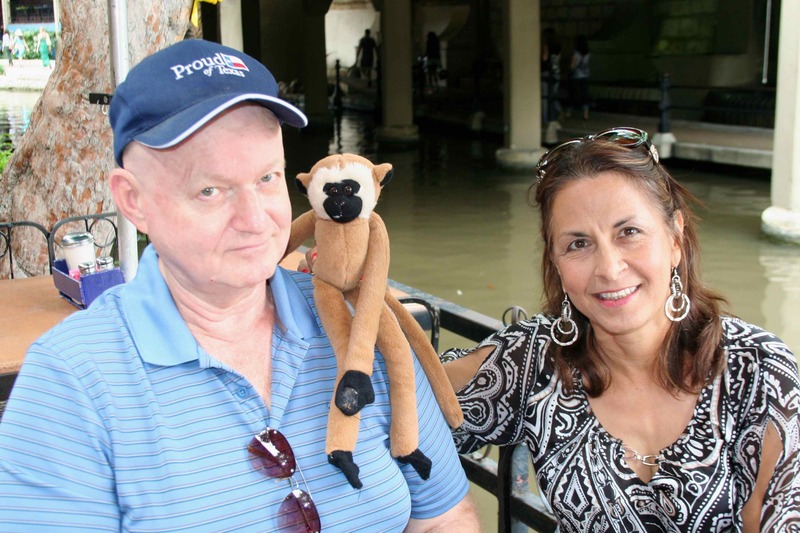 Grandma and Grandpa took me with them to a city called San Antonio. I like meeting new people, and he was right. I have never seen a river walk. I didn’t even know what it was! I learned. San Antonio has streets like any big city. It also has a river running through it. What makes it special are sidewalks along the river, and shops and places to eat all along the walkway. We were going to meet Uncle James and Aunt Geneva there. We walked along the river. It looked very interesting! We got to the restaurant early and Grandma set me down on a table while she looked around. That was okay — until the birds came. There were great big birds everywhere! “Where is the food?” one of the birds asked. “Is that thing good to eat?” She was looking right at me! He reached his long, sharp bill over and gave me a sharp peck. Ouch! I felt myself slipping, slipping, slipping off the table. If I fell off, I would land in the water and I don’t know how to swim. 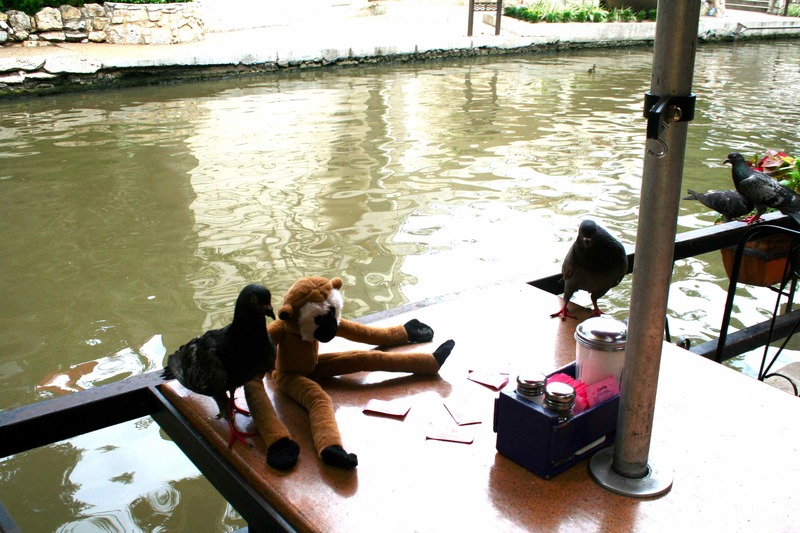 The river would carry me away and I would never see my friends again. How I wished I had a voice like a real monkey so I could call out to Grandma for help! She didn’t hear me, but she did think about me. “Shoo,” she said to the birds. “She picked me up and tucked me snugly inside her purse. I was happy to be there, safe and sound. Before long Uncle James and Aunt Geneva arrived. Grandma and Grandpa looked happy to see them. They looked happy, too, although Uncle James didn’t like having his picture taken with me very much. I don’t know why! 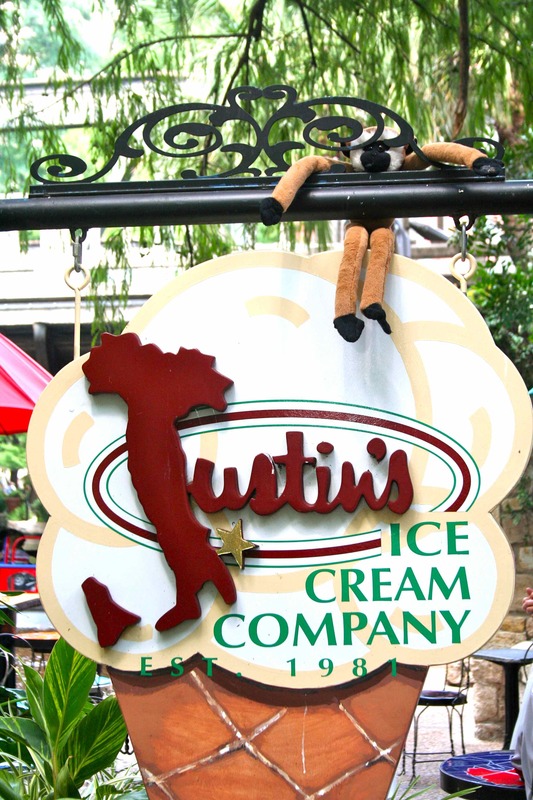 After dinner we had ice cream at a place called “Justin’s Ice Cream.” It made us all think of my friend Justin, so they all had ice cream cones there. I think Grandpa and Grandma must miss Justin and his brothers and cousins a lot! Yes, kids, I tend to be a little forgetful about poor Linkee. I’ll try to do better. I’m glad that God isn’t like me! He never forgets us and always takes care of us. 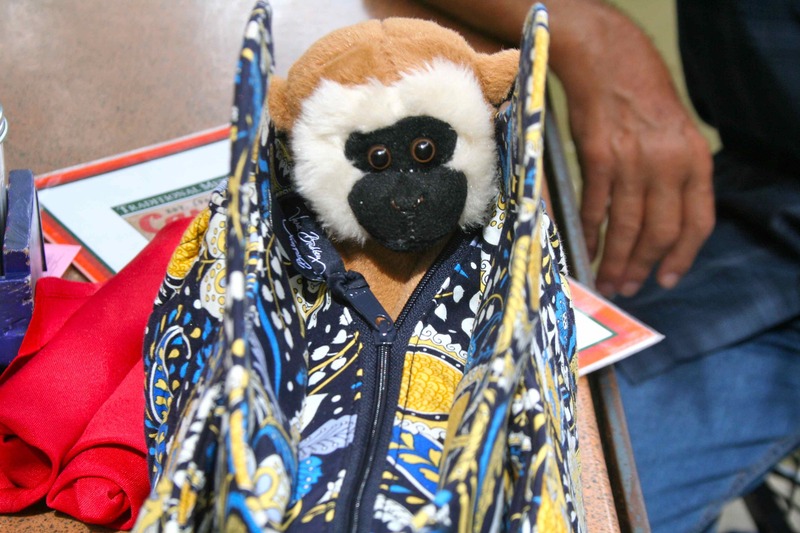 When we belong to Jesus we are like Linkee was when he was snuggled up in my purse. He keeps us safe and sound.